Capturing an organization’s equipment data, including the related documentation and the calibration and maintenance history of each item of equipment is a critical first step in implementing a Quality Process for equipment. It is critical to ensure that equipment is proactively maintained and calibrated to meet regulatory requirements and reduce downtime. 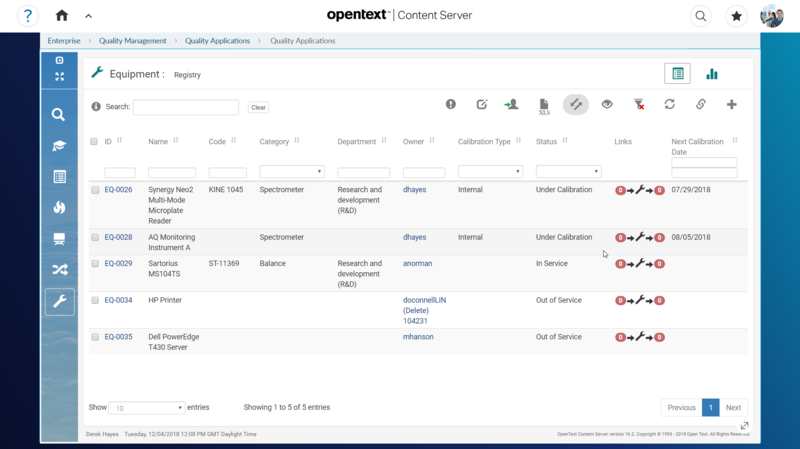 The Equipment Register is an Equipment Management Application for OpenText Content Suite which enables an organization to automate the management of their equipment. This provides workflow driven calibration activities initiated based on the next calibration date. The Application allows for immediate reviewing and reporting on all equipment status with the calibration and maintenance history helping an organization to highlight problematic equipment.